I stood staring at the library shelf, desperately trying to remember the name of that book! The one that I needed for our co-op meeting the next day. If only I had remembered to bring the book list, then I’d be on top of things. Homeschool Planet has allowed me to do just that! After a few hours of tinkering with the program, I found many, many reasons to love it!! Here are three! 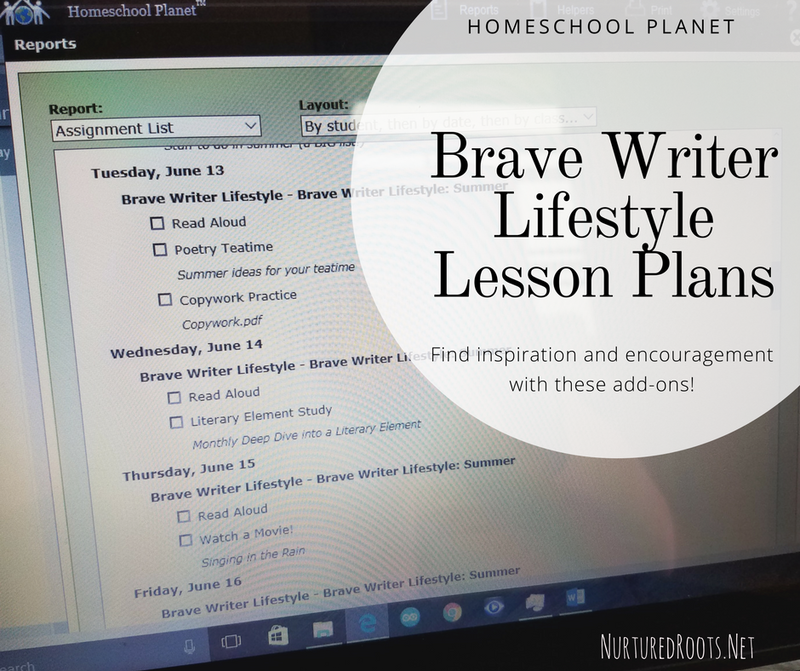 The Brave Writer add-ons are not your average lesson plans! Opening them up, felt like I had stepped into the most encouraging homeschool conference. Professional development for me, the homeschool mom: links to pdfs on topics like freewriting and copywork, podcast links that will inspire you to connect with your kids, and a treasure trove of wisdom right from Julie Bogart herself. A daily dose of support! Who doesn’t need that?! Even as a seasoned Brave Writer Lifestyle homeschooler, I found fresh ideas to enliven our days. With the Homeschool Planet format, I was able to easily rearrange the lesson plans to fit our family’s needs. All I had to do was click and drag the activities from one day to another! I’ve always been a paper planner kind of gal so I was skeptical about moving my planning online. Well, Homeschool Planet must have been reading the minds of all of us paper planner lovers because there are two print options: color or economy print! I’ve enjoyed having my master plan for the month printed out and tucked into my homeschool binder, and printing the weekly schedule has helped my kids to anticipate upcoming activities. Whichever method or combination of planning methods work for you, Homeschool Planet is adaptable. Homeschool Planet has quickly become a favorite planning tool. I love when I find a resource that I can personalize to fit my needs. Each home and family is different but we all need some organization to brings our good intentions into reality. Try Homeschool Planet's FREE 30-Day Trial! It's plenty of time to fall in love with it!